If you are craving tortillas but are making an effort to eat healthy, try out Joy McCarthy’s flavour packed recipe. It’s easy to make and doesn’t taste like a compromise! Toss bell peppers and zucchini with 1 tbsp of the olive oil, sea salt and black pepper to taste. Spread on a parchment lined baking sheet. Roast for 15 to 20 minutes or until vegetables are tender. You don’t need to stir them. Set aside. Heat remaining 1 tbsp oil in a large saucepan over medium heat. Add chicken, onions, garlic, cacao, cumin, chili powder, cayenne, dried herbs and sea salt to taste. Cook, stirring frequently, until no pink in visible in the chicken, approximately 15 minutes. Remove from heat. Meanwhile, in a small saucepan, combine black beans and water. Warm them over low heat, mashing them with a fork or toss into a food processor and blend until a paste. 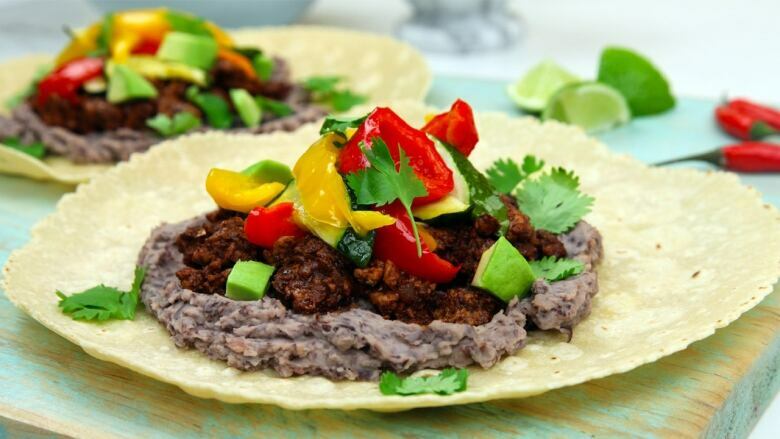 To assemble, spread beans on tortillas and top with chicken mixture, vegetable mixture, avocado and cilantro. Squirt with some lime juice. You can heat the tortillas to make them crispy. Heat about ½ tsp olive oil in a skillet over medium heat. Cook tortillas to make them crispy. Heat about ½ tsp olive oil in a skillet over medium heat. Cook tortillas for about 3 minutes on each side until golden brown.